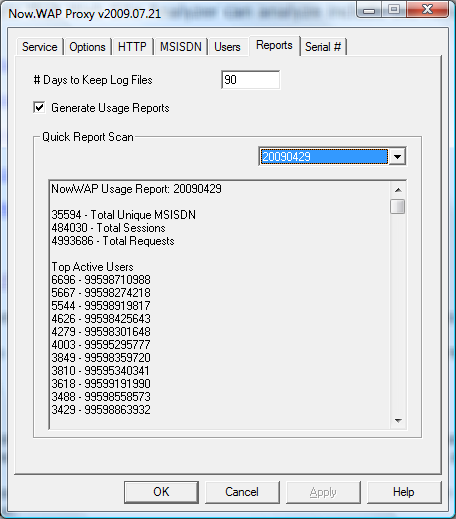 The log files created by NowWAP are of a text format that follows the common log format for web servers. These log files are stored on the NowWAP server, with one log file created for each day, using a file naming convention of WAPGW-yyyymmdd.LOG, where yyyymmdd is the 4-digit year, 2-digit month and 2-digit day. NowWAP 2011 has optional functionality which can convert these log files into a database format for further analysis. This functionality is enabled by checking “Generate Usage Reports” on the “Reports” page of the configuration dialog. When usage reports are enabled, NowWAP will automatically generate daily and monthly usage reports. These reports are located in the REPORTS subdirectory of the NowSMS installation. REPORTS\LOGDB contains SQLite format databases with one database per month. REPORTS\TEXT contains text format summary reports of NowWAP usage. Daily reports have file names of YYYYMMDD.TXT and monthly reports have file names of YYYYMM.TXT. Every night at midnight, a new daily report and updated monthly report for the current month will be generated. REPORTS\XML contains XML formatted summary reports of NowWAP usage. Daily reports have file names of YYYYMMDD.XML and monthly reports have file names of YYYYMM.XML. Every night at midnight, a new daily report and updated monthly report for the current month will be generated. The format of the XML report will be similar to the following. Note that some XML elements may not be present, depending on NowWAP configuration issues. Also note that additional XML elements may be added in future releases. ReportDate – YYYYMMDD for a daily report or YYYYMM for a monthly report. TotalSessions – The number of user sessions during the report period. TotalRequests – The number of user requests serviced during the report period. TopContentDomains – A list of the content domains which recorded the most requests (hits) during the report period. TopContentServers – A list of the content servers which recorded the most requests (hits) during the report period. It may be possible to create additional reports by developing your own queries of the reports database. Every day the log files from the previous day get merged into a monthly SQLite database format that is stored in the REPORTS\LOGDB directory. It is possible to download SQLite from www.sqlite.org, and use sqlite3.exe to run queries against the database.